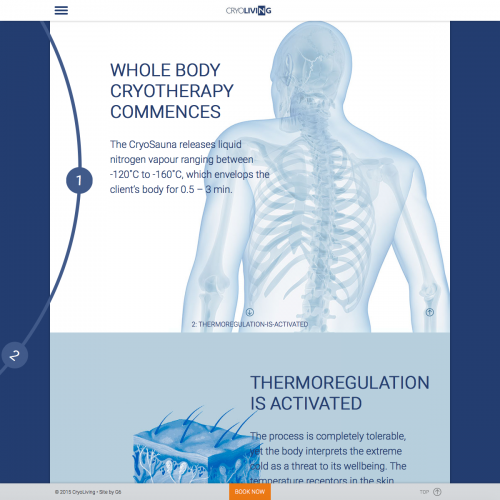 Cryotherapy is the use of low temperatures for healing and pain relieving proposes. It is one of the oldest and most widely used types of therapies, dating back to the seventeenth century. Most people are familiar with the use of ice packs or even ice baths to reduce inflammation and aid recovery. Whole Body Cryotherapy (WBC) is a procedure where an individual is exposed to ultra-low temperatures ranging between -120 °C and -160 °C. The client is placed in a cryogenic sauna for a short duration of 30 seconds to 3 minutes. This procedure is completely safe and over 2 million of these procedures has successfully been performed with our class leading Cryosaunas. With its open top and swinging door, it even caters for those that easily experience claustrophobia. Tremendous success has been achieved treating a wide range of diseases, injuries as well as promoting sport recovery and even playing a significant role in anti-aging. WBC has also been well researched offering empirical evidence for the effective treatment of many conditions (view our resources section). In some American and European countries WBC is prescribed by doctors well as being covered, by certain medical aids.